The setting in New Farm is laid back and sophisticated. The different cultures merge together to form a beautiful tapestry of architecture and scenery that is breathtaking. The one thing that remains constant in all the buildings that are coming up though is the use of paint. Paint covers walls inside and out and beautifies the suburb even further. There is something about a good quality paint that sets the building apart. 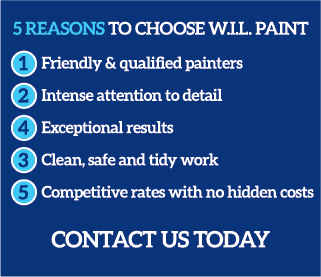 At W.I.L Paint we use this property and combine it with our skill and leave behind professionally-painted buildings. It is well known that paint is composed of chemicals that may harm the environment if disposed of improperly. We remain vigilant to make sure this does not happen. A painter in New Farm always makes sure that all lawns, stormwater drainages and gardens are left unharmed by the painting process. We go a step further and actually recommend the use of Low Voc water-based paints. These give off a minimal amount of fumes and this ensures that everyone remains safe during the application process and even afterwards when the work is done. They also have little effect on the environment. The environment is not just the greenery and air outside, it is also the area you work or live in. We do not like interfering with clients’ schedules or productivity so we try our best to remain unnoticed. This way we do not affect the daily running of your affairs. In the event that we cannot avoid interfering due to the nature of the work, we can assess the situation and see how to remedy it. Where appropriate, arrangements can be made to work after hours so that the job gets finished and schedules continue. We consider all aspects of your environment before we embark on your project. Call us today on 0431 452 312 for a quote and a painter.